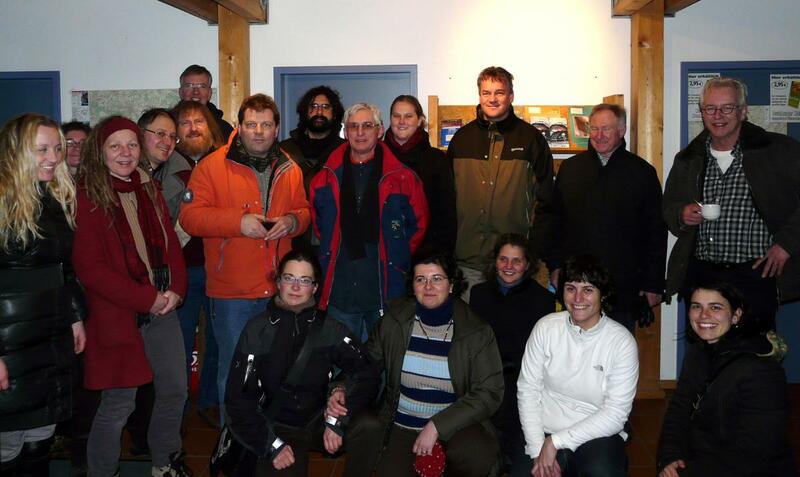 Days before Carnival broke loose, a total of 18 members of EXARC met for a 2 days’ workshop in Oerlinghausen (near Bielefeld, Germany), the archaeological open-air museum where EXARC once had its first meeting. This seems like a large group, but when initially all EXARC members were asked if they were interested, no less than 25 had responded. Grundtvig is a relatively simple (read: effective) way of international cooperation on adult learning. EXARC had learned about this possibility in late Autumn 2009 and with enthusiastic support from Senales and Oerlinghausen – now here we were! In principle, most of the ‘boring work’ had been done by all participants in the 6 weeks before this meeting: getting permission, getting signatures, exact details about the own organisation – now it was about the creative part: there were ideas, but what did we really like and following on this: what actually does or does not fit in a Grundtvig Learning Partnership? Good building blocks needed to be made, so the last (but most important) parts of the applications could be put in place. The deadline for filling them was only 8 days away! All applicants are members of EXARC, the International network of archaeological open-air museums involving in interpretation and education; we also have universities, schools and other organisations working in this field both in our network as well as in this Grundtvig Learning Partnership. Our type of education and interpretation is very much about hands on experience – the objects and buildings we use are reconstructions; three-dimensional witnesses of local and national heritage which are part of our common European culture. Our type of museums offer a low threshold and therefore we reach all layers of society. A special tool we have in our education is based on experimental archaeology; showing ancient crafts and letting people try it out themselves engaging them in a very direct manner. This way, history reaches all senses – the ideal starting point for informal learning. Our method is anchored in using staff telling the stories of our items more than written signs and machines. This is a very labour intensive approach, but it is highly appreciated and offers good quality. Several of our partners already have experience with EU cooperation, we had for example a Culture 2000 project (Delphi, House of Questions), focusing on what people were interested to find out when they visited our museums. We know from our long running visitor surveys that, we have (1) a higher percentage of return visitors (25-30%) and (2) people generally spend more time in our museums than they do in other kinds of museums (2-3 hours). These two challenges offers opportunities which so far are not or little used. Repeat visitors have requirements which we need to explore. This will allow us to develop fitting formats of interpretative activities involving staff and media before, during and after their visit. We for example think of using innovative cross media. The participants in the 2010 Oerlinghausen meeting were divided in 2 groups, each of them preparing a Grundtvig application by means of which staff exchange should be made feasible regarding adult education. Eight participants are in the "Zeitgeist" group, nine in the "Didarchtik". It will take until July before we know the results, until then, check our information at our EU projects'page.